French chemist who first discovered iodine, though he lacked the resources to positively identify it as a new element. [p.257] Iodine, one of the most beautiful of all the elements, was first observed in 1811 by Bernard Courtois, who was born on February 8, 1777, in a house just across the street from the famous old Dijon Academy. His father, Jean Baptiste Courtois, was a saltpeter manufacturer who used to assist Guyton de Morveau, the lawyer, in his brilliant lectures on chemistry. Thus the son lived constantly in a chemical environment, dividing his time between the paternal saltpeter works and the laboratories of the Academy. After Citizen Guyton was called to the Legislative Assembly in 1791, J. B. Courtois gave up his position at the Academy in order to devote all his time to the manufacture of niter. After assisting his father for a time, Bernard was apprenticed for three years to a pharmacist at Auxerre, M. Fremy, the grandfather of Edmond Fremy, the famous chemist. In [p.258] the meantime Guyton de Morveau had become the director of the École Polytechnique, and through his intervention Bernard Courtois was admitted to the laboratories of this school to study under Fourcroy. Here he entered into his research and courses in pure chemistry with pleasure and enthusiasm. In 1799, however, he was called to serve his country as a pharmacist in the military hospitals. In 1804, while serving as préparateur under Seguin, he made an important investigation of opium . Although J. B. Courtois failed in business, he was an honest man, and both father and son struggled hard to pay their creditors. In 1808 Bernard Courtois married Madeleine Eulalie Morand, a young girl of humble parentage who could barely read and write. Along the coasts of Normandy and Brittany many plants live at shallow depth in the ocean, and some of them are cast ashore by the waves and tides. For plants such as these the French writers of the early nineteenth century used the term varech,1 from which the English words wrack and wreck have been derived. 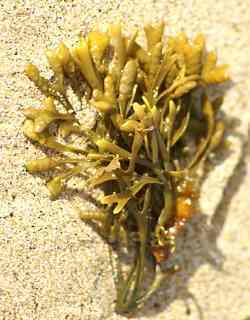 By burning Fucus, Laminaria, and other brown algae gathered at low tide, and by extracting the ash with water [p.259] Courtois obtained some mother liquors known as salin de varech, or soude de varech. The algae that Courtois used yield an ash containing chlorides, bromides, iodides, carbonates, and sulfates of sodium, potassium, magnesium, and calcium. In his day, however, they were valued merely for their sodium and potassium compounds, which were recovered by burning the dried algae in longitudinal ditches along the seashore and leaching the ashes at the works. As evaporation proceeded, sodium chloride began to precipitate, and later potassium chloride and potassium sulfate. The mother liquor then contained the iodides of sodium and potassium, part of the sodium chloride, sodium sulfate, sodium carbonate, cyanides, polysulfides, and some sulfites and hyposulfites resulting from the reduction of sulfates during calcination. To destroy these sulfur compounds Courtois added sulfuric acid, and on one eventful day in 1811 he must. have added it in excess. To his astonishment lovely clouds of violet vapor arose, and an irritating odor like that of chlorine permeated the room. When the vapors condensed on cold objects, no liquid was formed, but there appeared instead a quantity [p.260] of dark crystals with a luster surprisingly like that of a metal. Courtois noticed that the new substance did not readily form compounds with oxygen or with carbon, that it was not decomposed at red heat, and that it combined with hydrogen and with phosphorus. He observed that it combined directly with certain metals without effervescence and that it formed an explosive compound with ammonia. Although these striking properties made him suspect the presence of a new element, he was too lacking in self-confidence to attempt a thorough investigation in his poorly equipped laboratory and too poor to take the time from his business. He therefore asked two of his Dijon friends, Charles Bernard Desormes and Nicolas Clément, Desormes’ future son-in-law, to continue his researches in their laboratory at the Conservatoire des arts et des métiers, and allowed them to announce the discovery to the scientific world. Courtois was engaged for some years in the manufacture of iodine compounds and other chemical reagents, but in 1835 he was obliged to give up his business and go about the city taking orders. According to Fremy, he prepared very pure iodine, gave specimens of it to his chemical friends, and noted its action on organic substances. Fremy also said: They have been unjust to Courtois in treating him as a simple saltpeter-maker; he was a very skilful chemist (un chimiste très habile); he ought to have been rewarded for his discovery of iodine, and not left to die in poverty. [p.261] Courtois died in Paris on September 27, 1838. The Montyon prize of six thousand francs which the Royal Academy had awarded him in 1831 “for having improved the art of healing” had all been spent, and the widow, poor and uneducated, struggled against approaching deafness and blindness in a vain attempt to earn her living by lacemaking. It is indeed sad to know that her last months were spent in a charitable institution. The mother liquor from seaweed ash contains quite a large quantity of a very peculiar and curious substance; it is easily extracted; one merely pours sulfuric acid on the mother liquor and heats the mixture in a retort the mouth of which is connected to a delivery-tube leading to a bulb. The substance which is precipitated in the form of a black, shining powder immediately after the addition of sulfuric acid, rises, when heated, in vapor of a superb violet color. This vapor condenses in the delivery-tube and receiver in the form of very brilliant crystalline plates having a luster equal to that of crystalline lead sulfide. Upon washing these plates with a little distilled water, one obtains the substance in the pure state. Clément believed iodine to be an element similar to chlorine , and showed it, first to Chaptal and Ampère, and later to Sir Humphry.Davy. [p.262] The proof of its elementary nature was given independently by Davy in England and by Gay-Lussac in France. Davy showed that iodine vapor is not decomposed by a carbon filament heated red-hot by a voltaic current. In his classical research, the results of which were published in 1814, Gay-Lussac prepared hydrogen iodide and showed that it reacts with mercury, zinc, and potassium to give the corresponding metallic iodides, hydrogen, and no other product. In 1820 Dr. Coindet of Geneva introduced the use of iodine in the treatment of goiter. Long before this, however, it had been unknowingly used for this purpose in the form of ash from sponges. 1 The word varech is at present applied only to certain marine phanerogams used for packing and upholstering. 2 Although Courtois discovered iodine in 1811, the announcement by Clément and Desormes was not made until two years later. Therefore the centenary was observed in 1913. Images added (not part of original article) from sources shown above. Top thumbnail shows iodine crystals and vapour. Text from Mary Elvira Weeks, The Discovery of the Elements (1934), 257-62. Science Quotes by Bernard Courtois. 8 Feb - short biography, births, deaths and events on date of Courtois's birth. Bernard Courtois Picture Error! - This picture has previously been misidentified. Iodine: Why You Need It, Why You Can't Live Without It, by Charles Harvard Gibbs-Smith. - book suggestion.